With hot temperatures, crazy thunderstorms and long daylight hours in Montana, we’re officially in the heart of summer. Which means it’s time for another giveaway! 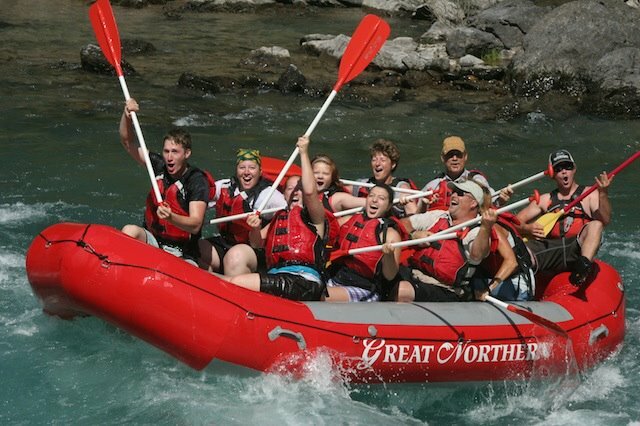 Up for grabs this week is a half-day whitewater dinner trip for two with Great Northern Resort in West Glacier this August. And the best part? Not only do you (and a friend) get to participate in a fun whitewater trip, you get to soak in the views of Glacier National Park and its surrounding area as you float the Middle Fork of the Flathead River. Plus, after your knowledgeable and (likely) charming guide navigates your crew over the rapids, he’ll turn into a gourmet chef and whip up a delectable meal for you to enjoy riverside. This could be you. Heck, you could even be the one playing the air guitar if you want. To enter to win, leave a comment on this post and tell us what you love most about summertime. We’ll announce the winner on Friday, July 27, 2012. Comments will close on Thursday, July 26 at 10 PM, Mountain Standard Time. Update: We’re happy to announce that NANCY STONE is the winner of the half-day whitewater dinner trip! Have a wonderful time rafting, Nancy! This entry was posted in Contests, Exclude, Glacier National Park, Summer, Things To Do, Water Fun and tagged Glacier National Park, Play, rafting, Summer on July 20, 2012 by tiatroy. My favorite thing about summer is the smell of fresh cut grass, hearing children laughing and playing. I also enjoy the longer daylight hours and flowers. I truly love the sunrises and sunsets.